Open concept spaces are becoming a huge trend now, where walls in your home are being torn down to create big spaces and combine the living, dining and kitchen area. This move away from traditional separate rooms have the added benefit of making the home look bigger and more roomy, while encouraging interaction among the people living in the house, especially for small apartments. 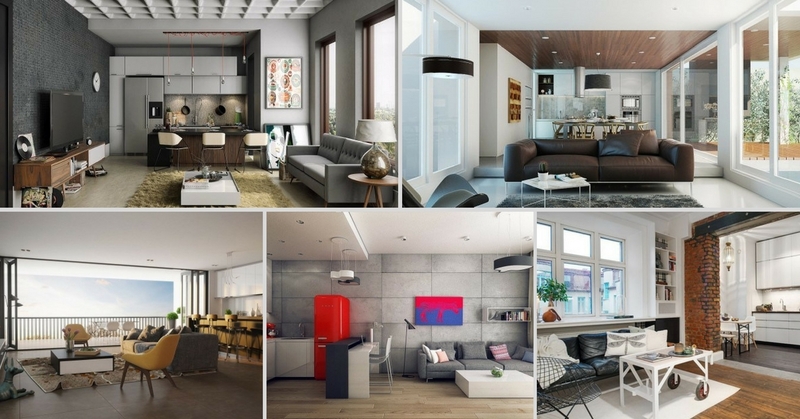 Get inspired with these cool ideas for an open concept living room now. Dining tables are huge bulky things that takes up a lot of space in your small apartment. While doing away with a dining table is not a good idea, get a slim and long breakfast counter which can be used as a dining table when you have guests over. Place it in a spot where it defines the living room and kitchen area so that your home looks neat. Going for an open concept space might have the tendency to make your home look cluttered, as there are no clearly defined walls to separate the areas. But it doesn’t have to be like that. Instead of walls, use fixtures and fittings such as placing a rug on the living area, a small dining table for the dining area and a kitchen counter for the kitchen area. While it is important to differentiate the functions of the spaces from each other, you should also choose from the same colour scheme when decorating your home. By doing so, you will make the whole area look more unified. Owning your first bachelor pad and want to make it look both masculine yet cosy? Play around with different textures in your home to make it look really awesome yet inviting. Get a furry shag rug, create a rough feature wall and add some interesting designs on your ceiling. Placing sofas and counters are a really good idea to keep the areas separate without a physical barrier. But to make it even more defined, you can consider constructing a tiny step that leads from your dining area to your living area, you just got to be careful and make sure that you and your guests know that the step is there otherwise you could end up face down on the ground! An open concept apartment can really benefit from fitting in glass doors that will bring in the view from beyond the balcony into your home. Not only will it bring it the breeze, but just imagine staring at the beautiful skyline and daydreaming when you sit and look at the gorgeous view. Opt for accordion doors which will fit better for a small apartment. There doesn’t need to be any physical barrier between the different spaces in your home in order to show that they are for various purposes. You can try something new and show the separation of spaces by using different types of flooring instead. This method has the added benefit of not taking any extra space as well. Lighting plays a major part in setting the right mood for a place, and even more so in the living room. Being more of an entertainment area, you can install lights that are suitable for watching movies or just chilling out with friends and family at home. It is common knowledge that neutral colours goes well with anything, but by applying light neutral colours into your open concept home, you can make the space look much bigger. And if it looks a bit too bland after doing so, just dress up the space with interesting colour accents because neutral colours works well with anything. if you are a fan or modern, minimalist decor, that’s fine, but what if your other half likes the rustic vibe instead? Well, you don’t have to worry because the apartment doesn’t necessarily have to be all in one single theme. In fact, by mixing it up nicely, you get a more interesting and unique home.